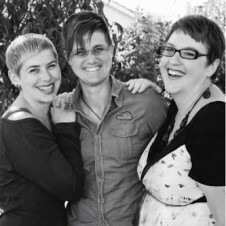 Tathra, Emma and Jac, a lesbian triad featured in Australia’s lesbian magazine Cherrie. She meets she, a U-Haul ensues, then comes marriage and now, with all the options available, comes a baby in a baby carriage. I love these relationships. They are deep and meaningful and valid and amazing. There is a sense of belonging that shows up with monogamous relationships that is life changing and for most exactly what makes them happy. Singular relationships are an awesome choice for many. Open relationships, polyamory, swinging, dating and monogamy are all normal, all doable and all ok for the person who chooses to embrace any one of these. A poly-minded perception of relationships will challenge your traditional views on relationships. Are you okay with one person for the rest of your life? Do you ever have a thought of attraction to anyone else while you are in a monogamous committed relationship only to feel shame for these feelings? Does your religion prohibit it? Does the idea of being in a relationship with more than one person exhaust you? Do you fear you can’t multitask? Do you just favor monogamy or can’t believe that you can love more than one at a time? Posted September 17th, 2013 & filed under Love.